The Cleveland Indians field a really young team, after just calling up Lonnie Chisenhall on June 27 to play third, and Jason Kipnis on July 21 to play second. And one mustn't forget their future pitching ace, Drew Pomeranz. Although Chisenhall is batting .259 in the majors, he's young (22) and will improve. Also, while Kipnis went 0-for-2, and was hit by a pitch in his debut Friday, he did play well defensively, including at least one highlight where he backhanded a ground ball and still had time to throw out Mark Teahen. Kipnis hit a lead-off home run in the Futures Game, which is a sign of good things to come. Since 2008, Chisenhall has signed just about every card out there. He's got a 2008 Razor auto (numbered to 699), and 2008 Bowman Chrome, 2008 Bowman Sterling, 2009 Bowman, 2009 TriStar Projections and 2010 Bowman Platinum autos with the typical print runs associated with those sets. 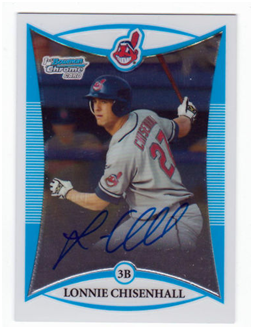 Chisenhall's best choices would be the 2008 Razor or 2008 Bowman Chrome. His cards are relatively affordable now given his less than stellar debut, so now may be the time load up. Kipnis has three autos available: his 2009 Donruss Elite (out of 319), 2010 Bowman Chrome (typical print run) and 2010 Tristar Obak (numbered less than 125). The Bowman Chrome is still the best card, but the low numbered Elite and Obaks are certainly good investments also. Pomeranz, the fifth overall pick in the 2010 MLB Draft, was just promoted from Class A - Advanced where he had a 1.87 ERA and struck out 95 batters in 77 innings. In his AA debut he had another good performance, striking out someone named Bryce Harper both times he saw him. There are quite a few Pomeranz cards to select from. There's his Upper Deck USA auto cards, ITG auto cards and his Bowman Chrome, Bowman Platinum and Elite Extra Edition autos. Don't worry about the Bowman Chrome, Bowman Platinum and Elite Extra Edition autos, he's sporting an identical pose for all of them (only the uniform changes). In that case, the choice is between the Bowman Chrome auto and the Extra Edition auto. Here, I'd prefer the Elite Edition auto because it's also an on-card auto, and because there's only 527 of them (the rest of Pomeranz's autos in that set are stickers or patches). Since the Elite is more scarce, it might be a better investment now. In Single A ball he's batting a hair below .300. Wolters plays shortstop and although he has committed a few too many errors, he's young (19), so as he ages, he'll play better. Wolters has all kinds of autos, including USA autos from 2009 Upper Deck, 2010 Bowman Chrome (stickers) and 2010 Topps, not to mention his non-USA 2011 Bowman Chrome autos. Given the low price of his 2011 Bowman Chrome autos (two blue autos went for under $20 on eBay), why not buy Chrome and go as high on the refractor ladder as you can?